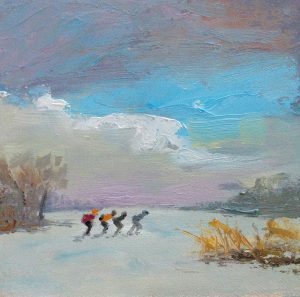 Iceskating in the Netherlands, oilpaintings. Everybody is loaded nowadays with christmas wishes and happy new years. I thought: not from me this time, although I wish everybody the best in the coming year of course! I spent my free time making some winterpieces, for coming in the mood. If we see rain outside in january, a bit of snow and ice on the open waters and the field must do the rest. Here a few very small ones, 13×13 cm. Very cute to frame them with a passepartout. Only € 85,-but be quick, next week they go to the Gallery! Okay, I didn’t go outside for painting, just photographing. Although the colors you must keep in mind… the photo gives you not that..